At times there is nothing nicer than sitting outside and viewing "Mother Nature." 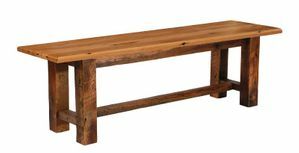 An attractive and comfortable rustic bench is perfect for this because it durable and can handle whatever she throws at it. Our wide selection of benches looks great and come in many different sizes. The bench has reintroduced itself into homes much like in the pioneer days but the wooden slab has been updated. Seating is expanded at the dinner table with benches on the sides or ends. LodgeCraft has a variety of benches for your indoor and outdoor needs. Select from our log outdoor furniture benches, hickory indoor and outdoor benches, and many more styles. Benches come in a variety of lengths, to suit your space needs. Half Log Bench with Back 36"
Half Log Bench with Back 48"